Rajinesh Prasad with his Master Cleaners Training Institute Certificate of Achievement. His passion for the job has earned Rajinesh Prasad a new role in the team that ensures CrestClean’s quality and high standards are maintained. Such has been the commitment shown by the Christchurch North franchisee that he’s been “fast tracked” to be one of the company’s training assessors. His eye for detail and his positive attitude was spotted by Adam Hodge, CEO of the Master Cleaners Training Institute. Rajinesh was undergoing training to become a Module 1 Trainer when his potential for an assesor role was recognised. “He showed so much promise that we moved him straight onto assessing,” says Adam. Rajinesh is now fully qualified as an assessor for franchisees taking the Certificate in Commercial Cleaning. The role of an assessor involves scrutinising franchisees’ competency. Candidates are given set tasks and the assessor checks whether they carry them out correctly, safely and to the required benchmark standards. He’s a strong believer that Crest’s business owners should put in the effort to get to know their customers. “If you want to become a good cleaner and run a successful business you have to communicate well with your customers. Rajinesh, who worked at Pak’nSave before buying his Crest franchise, runs his business with his wife Manisha Lata. They’ve had the business for four years and have doubled their turnover in the past year. “I really enjoy my job. I’m my own boss and cleaning is 100 percent for me, I love it,” he says. 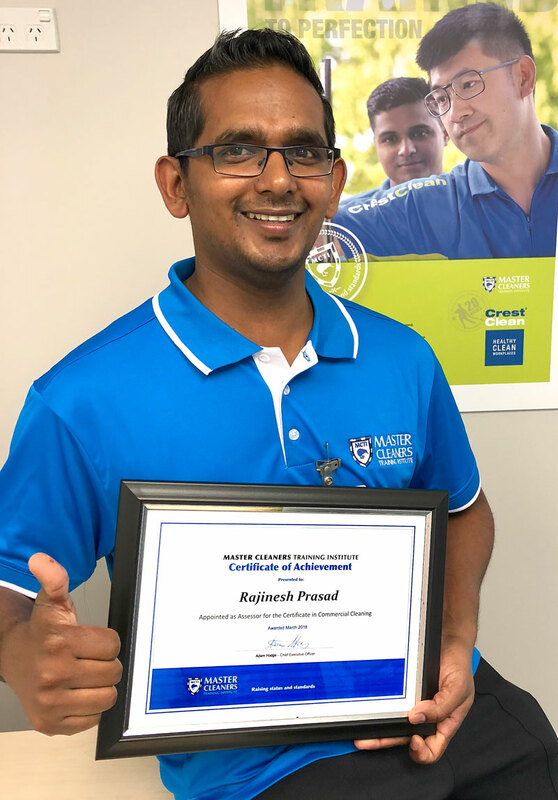 Yasa Panagoda, CrestClean’s Christchurch North Regional Manager, says Rajinesh and Manisha are a great team.